Awe YEAH! You read that correctly… Healthy CHOCOLATE exists. 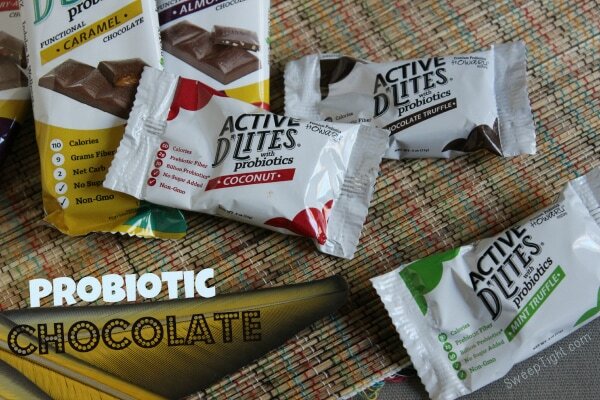 I am so excited to bring you this post about Probiotic Chocolate from Active D’Lites. I received product samples to facilitate my review, but all thoughts and opinions are my own. I received a variety of flavors and they were all super yummy. If I had to pick a favorite, I think it would be a tie between the Mint Truffle and Caramel Active D’Lites. I really don’t need much motivation to eat chocolate. I mean, seriously who does! But, I am horrible about taking my vitamins everyday, and probiotics—well, I definitely do not take those regularly. :/ Now that they come in this form, I not only remember, but look forward to taking them! 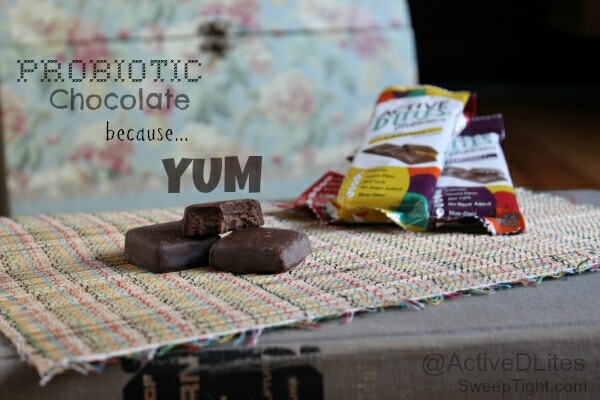 You can read all about the benefits of probiotics on the Active D’Lites website, but I have to say I completely stand by them. I have studied enough about our digestive tract to know that probiotics are great for our systems. The tricky part is getting them to survive our stomach acid. Which is why it is important to have billions of them so that a portion of them make it to our intestines where they work their magic. If you’ve ever had to take antibiotics or other medications for a decent amount of time, you know how easily our systems can be thrown off balance… and how long it can take to recover. Or maybe a change in your diet caused an imbalance. But whatever the case, a healthy dose of probiotics encourages healthy guts. 🙂 After taking these for just a week, I can already feel a difference! 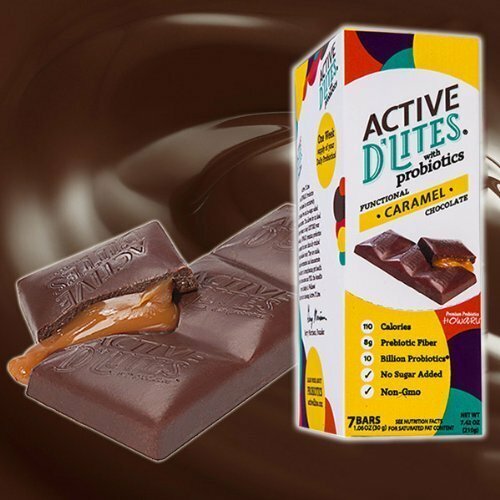 Active D’Lites provide 10+ billion Probiotics, only 3 net carbs, no sugar added, low calorie portions and are non-GMO! The daily bites are awesome. I was treating them like a reward I would have earn for remembering to take my other multivitamins. Having chocolate as part of my daily routine just makes the whole day better! With Valentine’s day coming up, give the gift of chocolate without the guilt! And OMG, they make probiotic ice cream too!? Cranberry-Almond Bar (Box of 7) sounds like perfection. Yum!! 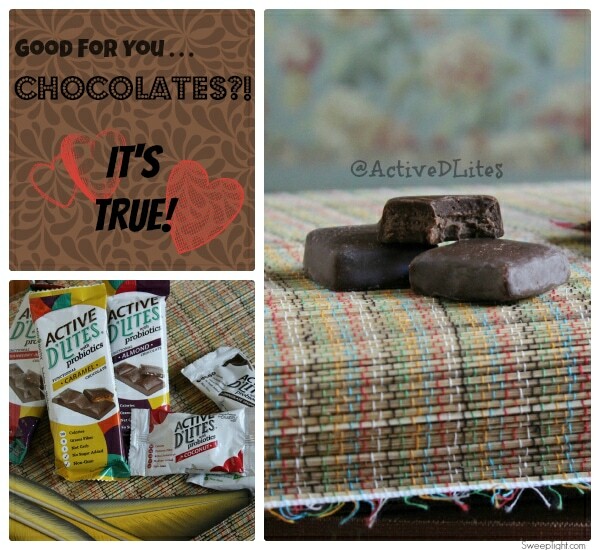 I’d love to try the Active D’Lites Chocolate Chocolate Truffle Bar and the Active D’Lites Chocolate Chocolates Almond Bar. Thank you for sharing this review.